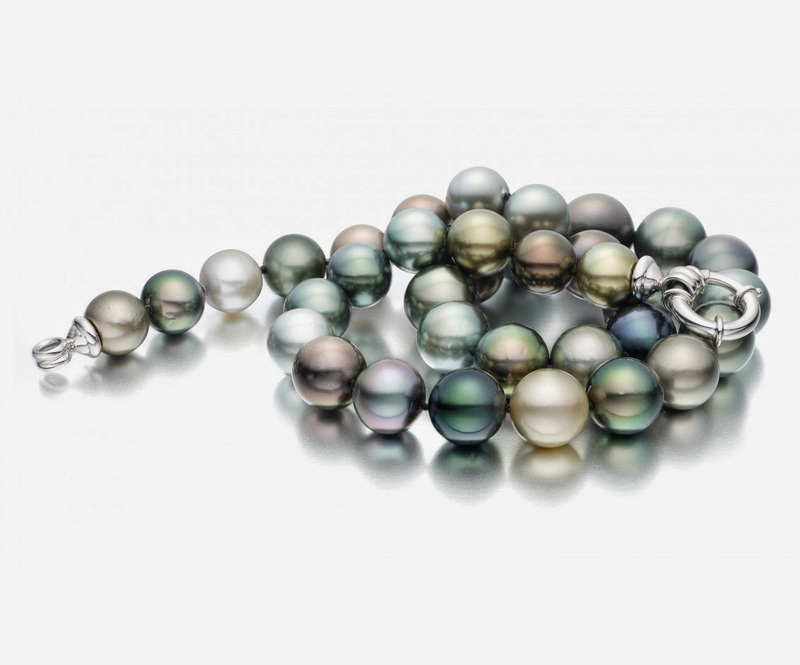 Just before the Passage shuttered for summer holidays, I received a letter from a reader, Dorothy B., who attached an essay she had written about her uncharacteristically luxurious purchase of a Tahitian pearl necklace. Dorothy generously agreed to my request to publish it; I can't think of a better way to re-open the Passage! Three things happened in the space of a year: I visited the V&A Museum in London and saw a special exhibition, "Pearls", purchased a Tahitian pearl necklace in a coup de coeur moment at a department store near my home, and began reading Passage des perles, a well-crafted blog by a woman of a certain age in Montréal. Coincidentally, it was also a year in which I had a landmark birthday. The trip to London was my third. My full-time job at a private club is busy and often stressful, so after falling in love with London on my first visit with a friend, I have returned twice on my own, free to wander, take a side street or not, to sleep or rise when the notion suits me, to eat or drink, sit or walk, shop, study or linger. I can even waste time in my hotel room gazing at the top of trees in Prince's Park at sunset or watching Londoners hurrying to work in the gray mist and half-light of early morning, bundled in black coats and long scarves. 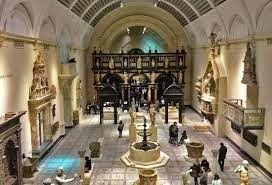 In London, a city full of energy and optimism, I return to my two favorite museums each visit, the V&A and the British Museum, elegant, massive and endlessly fascinating, from the buildings themselves to the quality of light, the exhibits, the international visitors, the shops, cafés and bookstores. At the V&A, I noticed that a special exhibition on pearls was in progress, and decided to see that as well. Compared to the grandeur of the main museum halls, the exhibit space was surprisingly modest—a small room tucked off a long corridor. The room was darkened, and a labyrinth of passages guided visitors through the displays. An educational tableau with a video described the pearl industry. Tall vintage wooden "safes" showcased dazzling pearl necklaces, brooches and tiaras. Portraits of nobles wearing all varieties of pearl adornment were displayed on the walls. The room was crowded and progress slow, so I only stayed long enough to walk the exhibit once. Later, I purchased the catalog, a hardcover book titled "Pearls" to give to my friend, a sometime traveling companion. The cover photo had drawn me into the exhibit in the first place—a photo of a contemporary pearl necklace by a young Vietnamese artist. It resembled abstract art: ice crystals on a bare branch, a haiku of frozen pearls. Back in Central Florida a few months later, I browsed the jewelry case of a local department store when a glimmering necklace caught my eye. 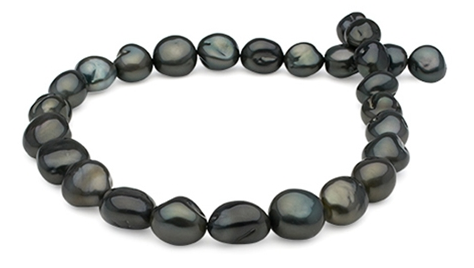 I was mesmerized by a multicolored Tahitian black pearl strand of fairly substantial size. The pearls had a satiny appearance—beautiful, soft and lustrous. The necklace looked good with the outfit I wore that day and on impulse, I purchased it, even though it was more expensive than anything I would normally buy. It didn't take long to realize that my purchase was too expensive. I returned the necklace to the store with some regret. A few months later I visited the store again; the necklace was still available, displayed in the same case. After much deliberation, and after circling back a few times, I bought it again. However, I was still not convinced this was a good idea, and for weeks I delayed a final decision. I spent many evenings researching Tahitian pearls. I read about the lore and language of pearls, the history, grading, major suppliers and reputable outlets. I studied the difference between freshwater and saltwater pearls, natural, cultured and synthetic. I browsed the website of high-end purveyors such as Mikimoto and Robert Wan and contemplated buying less-expensive vintage pieces. Still the black pearl necklace sat in the velvet-lined box in my drawer. I kept the price tag on it and every now and then would try the necklace on, to see if I really wanted to commit to the expense. But I could not seem to return it. Then one evening I stumbled on a blog, Passage des perles, written by an over-50 woman based in Montréal who calls herself "Duchesse". She recounts stories of outings with girlfriends, ponders various jewelery and clothing purchases, rages at injustices and considers retirement. The feeling is that of having an online girlfriend, convenient on those 3 a.m. nights when stress from sleep interrupts work. Many of the posts discuss pearls, so I continued my research there. After a little more study and more than a little apprehension, I decided to keep the Tahitian pearl necklace. I had fallen in love with it instantly, an unusual situation for me. In truth, I had never been that fond of pearls—I didn't think they looked good on me. White or off-white pearls, so beautiful in the case, never looked right or flattering. But when I tried on the Tahitian pearls, what a remarkable effect—the gray, black and taupe undertones looked wonderful. In fact, they seemed to take on a life of their own, as if they had an inner light; the shades of peacock and gold and aubergine fairly glowed. I could hardly bring myself to remove the necklace in the store. In the end, I don't know if it was a "good" or wise purchase or not. But I have come to realize something else, something that seems true to me: young women, on the whole, do not wear pearls well. True, teens often receive a "princess" strand for graduation and many young brides wear pearls. But the result always looks a bit forced, an attempt to look more mature or professional or well-dressed, and the jewelry seems out of step with their years. But on an older woman, what a difference! 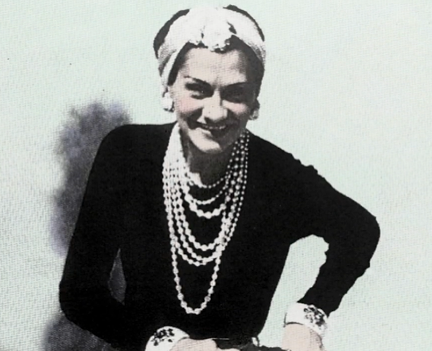 Coco Chanel, of course, but also Jackie Kennedy, Christine Lagarde and Nancy Pelosi—even Barbara Bush—wear pearls with aplomb and confidence. And the pearls look right, in fact the larger the better. The pearls look good on them and vice versa. At 60, a coup de coeur is not such a bad thing. Frequent but often fleeting in youth, the event rarely happens these days. To find something that feels right, appropriate and flattering—earned simply by reaching a certain age—is a gift in itself. So I decided to keep the Tahitian pearls after all, the black pearl necklace shimmering with inner light, a gift from the sea, to mark that passage in my own life, a solo voyage. The necklace is a symbol of a gift coveted and conveyed, unexpectedly, by age and spirit and time. I am grateful for London and the V&A, for pearls that find their way from the bottom of a sea a continent away to a store nearly, and for Passage des perles, always open for business at 3:00 a.m.
More Tahitian temptation: have you seen the new Tahitian Provoked Baroques? No, they don't bite! An innovative bead-nucleated baroque of remarkable size, this new variety delivers exceptional colour and luster. You can read about the "provocation" process here and admire some strands in Pearl Paradise's online store—I'd really like to try one of those on! The necklace prices range from $2,850 to $3,150, so I'm hoping PP will offer them as pendants, too. Whether you prefer subtle dove grey or the deeper-hued body colours, hold out for your version of Dorothy's heart-stopper. Should you wish a gentler investment, this Tahitian bracelet from Kojima Company delivers an array of rainbow hues without breaking the bank; price, $207. I love everything about this: the writing, the story about travel, the quest for beauty. Love the paragraph about you also. She "gets" all your idiosyncrasies and interests--or at least those of your on-line persona. Sometimes it seems that we are drawn to an object of beauty. This is a lovely story of travel and the possibility of treating ourselves to something that we really love. I've been thinking about this essay since I read it early this morning---and about some beautiful pearls I saw in Santa Fe last month. Just had my own moment of happy madness--walked in to local jeweler intending to buy turquoise et in gold earrings. But, there in the case was this luminous strand of LARGe keshi pearls. Be still my heart, but not my credit card; happy to say they are mine and they make me feel great. The pearls seem a perfect gift for a, milestone birthday. I understand the writer's hesitation considering that they are an investment, a beautiful strand that will bring joy to the wearer and if worn often perhaps they will become her signature look. I think milestone birthdays are a great excuse to treat ourselves to something that we might not need, something a little frivilous that makes us feel wonderful. Hello! What a beautifully written essay! It is fun to have you back online with all your interesting ideas. I bought one gorgeous Tahitian pearl in Moorea. I had no plans to buy one, let along a gem-grade pearl, but was fascinated by its gorgeous colors. For those who have a lot of pearls (real or not), I want you to know that your comments on "unprissing your pearls" was fab. I actually put into practice some of your ideas! I agree--a lovely essay, and well worth re-reading. A wonderful post-a joy to read on several levels.....I know I'll be rereading it again - to really savour all of it. What gorgeous pearls and what a gratifying and beautiful letter to receive! I was wondering: is there any way for an amateur to tell if pearls are real? I saw some pretty ones recently in an antique store, with a sign saying they were real, but how to know? These comments pertain to differentiating cultured pearls from man-made; determining if a pearl is •natural• (versus cultured) is difficult to do with just the eye. Gemological labs use x-rays to see if there is an implanted nucleus. Pearls are wonderful. Glad you are back posting. Imagine my suprise to see my little blue "provoked baroque" pearl shown on your blog. It is now set as a pendant. Welcome back - so pleased to have some more posts to look forward to. I hope you had a lovely summer. On the topic of Tahitian (as opposed to just black pearls), I inherited the most beautiful rainbow coloured pearl pendant from my mother. She bought it in Tahiti and I haven't seen one anywhere that glows with the same lustre of greens and blues and purples. I feel powerful wearing it. Anon: Did yours come from from PP? Eleanorjane: Lucky you, I would love to see that! 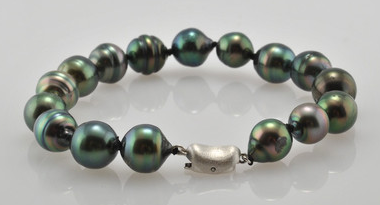 That's right, not all black pearls are Tahitian and vice versa; black non-Tahitian pearls are dyed. Psru: Hong Kong is a great place to shop for pearls, for both you and as gifts. Use your eyes and negotiate. Yes, the pearl did come from PP Jeremy made it into a pendant for me.It is pared with a RobertWan green Tahitian below it. You can see the finished pendant mid way down on this thread of my pearls. I have enjoyed reading your blog for years. Anon@1:48: Thank you; your pendant is breathtaking. The simplicity of the setting presents those stunning pearls perfectly. I hope all readers drop by to look. What a lovely essay! Thank you to you both.